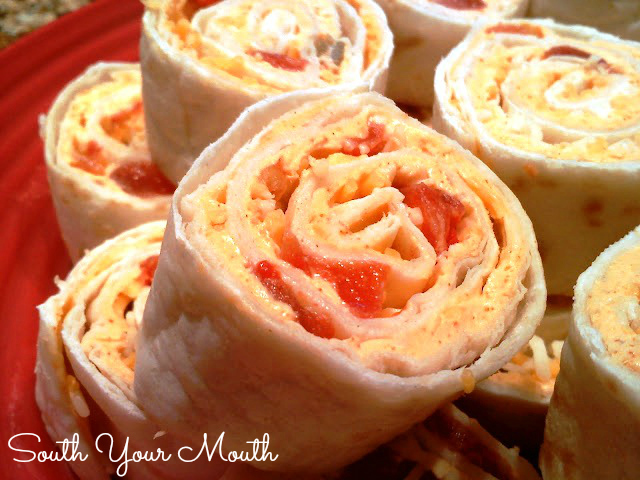 Easy and impressive tortilla roll-ups or pinwheels made with cream cheese, taco seasoning, Rotel tomatoes and chilies and cheddar cheese. Today I had some of my best buds over so our kids could swim and have a play date. And of course that meant I had to make cocktails. Lots of cocktails. I decided to make my favorite mojitos. And since someone was bringing chips and salsa I decided to keep rolling with the Mexican theme and experiment with what I'm calling Queso Roll-Ups. Why "Queso"? I'm not completely sure... maybe because if you melted all the ingredients together, I think you'd prolly have some wicked queso. And maybe because I decided on the name after a few mojitos. Because lets face it, y'all, I know about as much as a polar bear would about Mexican cuisine. But whatevs... these were amazeballs and I'll definitely be making them again. I might even think about adding chopped green onions and black olives next time. My favorite part about making these is rolling them in the plastic wrap. Lay a section of wrap on the counter, place your roll-up length-wise on it at the edge closest to you. Bring the side of the plastic up and over the roll-up and wrap it as tightly as you can. THEN (this is the fun part) grab the loose wrap on each side like handles and roll the roll-up away from you. It will get wicked tight! Do it a few times if necessary. With an electric mixer, beat cream cheese on medium speed until fluffy. Add taco seasoning and mix well. Spread each tortilla with cream cheese mixture. Sprinkle tortillas with Rotel (tomatoes and green chilies) then top with shredded cheese. 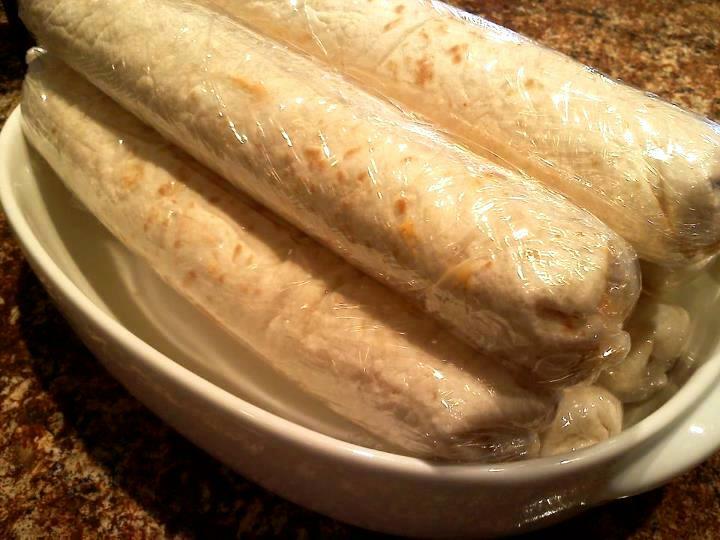 Roll each tortilla very tightly then roll in plastic wrap (see below). Refrigerate for 4-6 hours. When ready to serve, slice into pinwheels. Love this so much! I think I'll be making these for Super Bowl! Found you at Country Cook Weekend Potluck! These look yummy! I love roll ups! is there an alternate to the Rotel (I don't do spicy/chillies very well). Could I do this with salsa, like from a jar? I love these and have been making a different version of them for years. First I spread on cream cheese, then a think layer of beans, followed by taco meat or even a finely chopped fajita chicken, then guacamole, sourcream, cheese, sometimes rotel, sometimes salsa...however you have to be careful they don't get too wet or you have a mess. 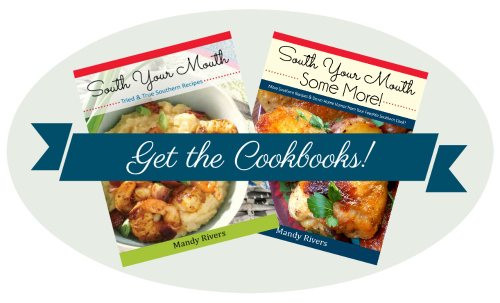 They are always a hit. I love the idea of how to wrap them. I usually make them in advance and then let them sit a few hours in the fridge or even over night to let the flavors "marry". Thanks for reminding me of this recipe. replace mexican blend with pepperjack melt together with cream cheese...leave out the taco seasoning and rotel ..... stir in some cool ranch doritos (powdered in processor) add green onion and/or black olives..then rolled.